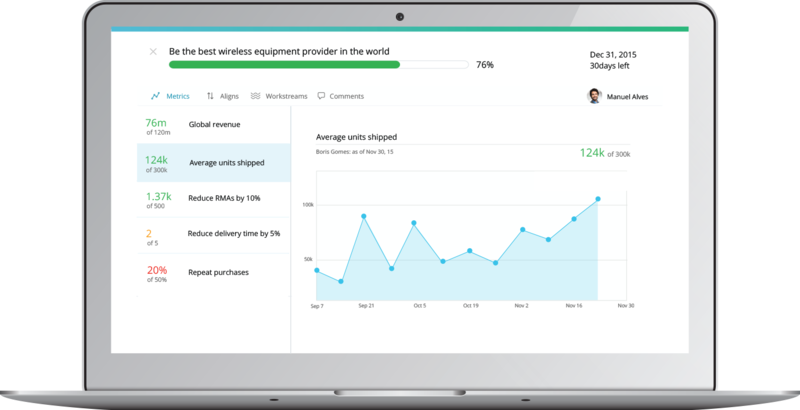 Redwood City, CA, November 19, 2015 — Workboard, a fast-growing provider of real-time goal management solutions, unveils its latest app for line of business leaders to raise achievement velocity, gain greater agility, and improve cross-organization collaboration. The new features and improvements give leaders continuous transparency on business and operating goal progression and enable them to respond to changing market conditions much more dynamically. Workboard gives leaders greater capacity to coalesce and coach people to better outcomes on their most strategic initiatives. This is the latest in performance management from Workboard—catered for goal-driven, data-starved executives and their teams. And first and foremost, it brings to light Paknad’s measure of modern organizations, VQ—the most telling metric that you’ve never heard of for performance. What does VQ measure? The rate of achievement and essential factors like speed, goal alignment and transparency—the must-haves of an agile, high performing organization. “Companies have always struggled to align execution to strategic goals, but it’s infinitely harder in a hyper accelerated, competitive climate. Business leaders need faster, more dynamic tools for setting and sharing goals, galvanizing efforts and getting continuous transparency,” says Paknad. The new Workboard features, available at your fingertips through mobile, provide a full view of all objectives and key results. People’s goals are as visible as their email so it’s much easier to focus; in fact Workboard users report checking their goals and syncing their work efforts in the app an average of 15 times a week. Progress is updated automatically and both goals and results visible across the organization, so cross- organization collaboration is better enabled. “Workboard gives leaders and their teams a simple, but powerful tool to stay aligned on goals, work at their highest levels, quickly triage execution roadblocks and accelerate achievement. Team members love the goal clarity Workboard provides, which empowers them to do great work with confidence; leaders love the velocity, scale and agility it brings their organization—the essential value of modern goal and performance solutions,” adds Paknad. Workboard Inc. provides real-time goal management solutions to amplify business results and elevate people. Its next-generation mobile and Web app helps line of business leaders implement dynamic short-range goals and modern achievement models like Objectives and Key Results, streamline execution, and improve their coaching and recognition. Thousands of organizations use Workboard to make work easier, more meaningful and successful including large pharmaceutical, financial, technology, oil, and manufacturing companies. For more information, visit www.workboard.com. Workboard's enhanced Goals capabilities provide a full view of all objectives and key results.